Coverage: Live on BBC Radio 5 live (build-up from 19:30 BST) plus live text commentary on the BBC Sport website. If the early stages of this year's World Cup have taught us anything, it is that world rugby's accepted orthodoxy is under threat and that the game is evolving in ways few people predicted. Japan's victory over South Africa and stirring displays by other Tier 2 teams, not least Fiji against England, suggest they are now better designed to cope in this rarefied environment. At London's Olympic Stadium on Thursday, this theory will be given its most rigorous test when defending champions New Zealand play Namibia. If Japan are minnows, what does that make Namibia? Plankton? A team at the mercy of world rugby's mighty currents and fodder for its biggest beasts. Time for some numbers and perspective. According to World Rugby, Japan has almost twice as many registered senior male players - 53,000 - as New Zealand. England has 167,000. Namibia has 1,080. In addition, Japan has a thriving professional league. In 2012, it was reported that South Africa's Jaque Fourie, of the Kobe Steel Kobelco Steelers, was the world's highest-paid player. Namibia's squad recalls a more romantic age. "We've got engineers, diamond traders, farmers and construction workers," says Jacques Burger, Namibia's captain. "And a dentist, which is handy." The dentist is number eight PJ van Lill, who recently downed drills to pursue a full-time rugby career in France. Prop Johnny Redelinghuys, who like Burger is playing in his third World Cup, owns a steel construction company. Another prop, Jaco Engels, is playing in his first World Cup at the age of 34, having retired from professional rugby two years ago to pursue a career in law. Burger, Saracens legend and Namibia's only world-class player, was himself a sales rep in his native Windhoek, Namibia's capital, until 2004. Raw talent and a little bit of luck led him to the promised land of professional rugby in England, but it remains an alien environment to the majority of his team-mates. "For us, it's all about these guys who work eight to five every day," adds Burger. "They wake up at four or five in the morning, train, go off to work all day, come back in the evening and train again from six to 7.30. They're incredible." So while Namibia president Hage Geingob has implored Burger's boys to "give the All Blacks hell" - Geingob sounds like the kind of man who would detect a silver lining in a mushroom cloud - Burger realises that the best Namibia can hope for is to play with pride and show some tangible signs of progress. "Playing the All Blacks at the Olympic Stadium is incredible for Namibian rugby," says the 32-year-old Burger, who was voted one of the five best players of the 2011 World Cup in New Zealand, despite playing with a serious knee injury and his team losing all four matches, shipping 266 points in the process. "A lot of our guys are amateurs and look up to these guys as idols. The experience for all the players - including me, because I've not played against them - will be great. I want to weigh myself against the best in the world." In 35 Tests spanning 11 years, Burger has played against a Tier 1 nation outside a World Cup only once, when Namibia were crushed 105-13 by the Springboks in 2007. No wonder they are yet to win a World Cup game in 15 attempts. In 2003, Namibia were marmalised 142-0 by hosts Australia. South Africa and Wales put 80 points on them in 2011. Since that 81-7 defeat by Wales in New Plymouth, Namibia haven't played against a side currently ranked in the top 15. For the so-called 'development' nations, their experience at World Cups is akin to a club boxer suddenly being thrown into a ring with a heavyweight contender at Madison Square Garden. Without seasoning, they are destined to be embarrassed, over and over again. Japan's improvement is down to a lucrative league, containing genuine world-class talent, and the injection of boundless resources. Japan, lest we forget, has the world's third biggest economy. The Pacific nations and emerging European sides, such as Georgia, have players plying their trade in elite world leagues and the experience they gain is ploughed back into their respective national teams. Namibia prepared for this year's World Cup by sharing a training camp with the Springboks, but that was merely sparring. Perhaps what Namibia need more of are learning games against Tier 1 'A' teams, although tours require money and time, which countries like Namibia and its amateur players simply have not got. What cannot be the answer, as some have suggested, is the creation of a parallel 'plate' tournament for these development nations. It is strange enough that the Six Nations is a closed shop, given that Georgia have won the European Nations Cup (the Six Nations 'second division') seven times in eight years and are currently sitting two places above Italy in the world rankings. Denying Namibia and their ilk a brief bask in the sun every four years would be equally unfair. 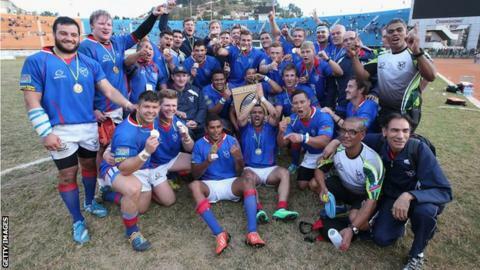 For Namibia's head coach, Phil Davies, the World Cup has provided the chance to introduce more professional systems, including a weight training programme for his amateur players, which was only implemented in February. "The Namibian Rugby Union has worked incredibly hard to establish a high performance centre," says former Wales international Davies, who replaced Danie Vermeulen in controversial circumstances in June, amid claims of racism and political interference. "A quality analysis and player monitoring system is now in place and we're working on putting an academy system together and developing the domestic club game. World Rugby does a fantastic job in trying to develop below the top tier and, slowly but surely, the infrastructure is growing. "And the players' commitment has been extraordinary. We've done nearly 40 training sessions at 5am at the national stadium [in Windhoek], which is a new experience for me. "But there is no comparison [between Namibia and Japan]. Japan are a fully professional team. All we can do on Thursday is go out and play to our full potential and give a good account of ourselves." For Namibia, a wildly successful World Cup would mean victory in any one of their four games - Tonga, Georgia and Argentina are to come. And Japan's upset of the Springboks has altered perceptions of what can and can't be done. "It would be stupid not to be inspired by Japan," says Burger. "I didn't see it coming. But people will now start believing. This will be my last World Cup, so I have to believe that this is the year we finally win a match." So get behind Namibia's engineers, diamond traders, farmers and construction workers on Thursday. And fingers crossed their dentist isn't forced to start revving his drills again.